Although there's an amazing variety of gins, garnishes and glass options available, this is our definitive recipe for the perfect G&T. The history of the gin and tonic is closely linked to modern British history. It is a product of soldiers stationed in India who mixed their medicinal dose of quinine water to ward off malaria with their daily ration of gin. For many years in the 1970s and 80s, Brits turned their back on the classic G&T as poor-quality, mass-produced tonic waters drowned out any of the gin's flavours. 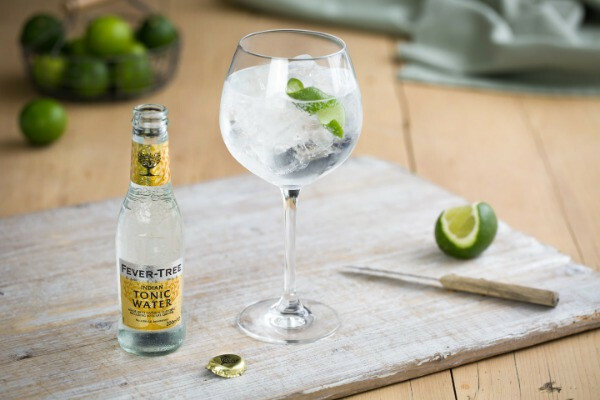 However, with the advent of premium tonic waters and a relaxing of British laws that allowed small-batch gins to be sold, the country has once again fallen in love with the gin and tonic, with £1.9bn of gin sold in 2018, according to the WSTA. The Spanish use a copa glass to serve gin and tonic - it's a big balloon glass that lets the wonderful aromas of the drink's botanicals be released, adding an extra level of flavour. At home, a large wine glass is a perfectly fine substitute. Add the ice first; ideally, they will be large, clear cubes and you should have plenty of them - the more ice, the less likely they are to melt and dilute your drink. Pour over a measue of gin followed by three times as much of the Premium Indian Tonic Water. As lime is a sweet citrus fruit, it works really well with a typical gin and tonic. It's the oils in the rind we're after here, rather than the juice of the fruit, so peel a strip from the outside, twist it over the top of the glass to spritz the oil into the drink, then drop into the glass. Drink from the glass instead of through a straw to ensure you get the full flavour experience.